A DAY WITHOUT LAUGHTER IS A DAY WASTED. WATCH “SONU KI TITU KI SWEETY” AND HEAL THE HURTS. LUV RANJAN – of PYAAR KA PUNCHNAMA 2 fame – is back with his team of actors and a new film, SONU KI TITU KI SWEETY. SKTKS is unquestionably funny and it will surely heal a lot of hurts. Albeit it’s set in a parallel PYAAR KA PUNCHNAMA zone, the film is about two CHADDI BUDDIES. Despite the frequent misogyny, the film touches the chord of youth. 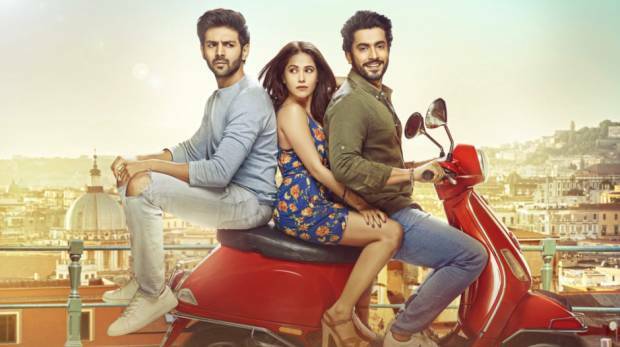 The Chaddi Buddies, KARTHIK (SONU), and SUNNY (TITU) are inseparable, but LUV RANJAN’s drama, brings a girl in between and the insecurity of Sonu escalates towards Titu as he finds his friend naïve in love affairs. Though NUSRAT BARUCHA (SWEETY) comes into Titu’s life through arrange marriage route, still Sonu finds her a gold-digger, she cannot be so good to be true and determines to break them up before wedding bell toll. Titu always hooks up with all the wrong girls and doesn’t even realize that they are fooling him and Sonu has always had to step in to save him, therefore Sonu perceives Sweety as one of them, but Sweety ignores and keeps her busy in impressing Titu’s family, MR. ALOK NATH a cool granddad and his friend VIRENDRA SAXENA. Consequently, the war between BROMANCE and ROMANCE begins and continues and makes the film consistently funny. Karthik has done justice to his character. Though the script is a bit skewed in Sonu’s favor, still audience connects with Sunny Singh’s performance, whereas Nusrat manages to hold her own, despite little help from the script. The co-actors, Alok Nath and Virendra Saxena are memorable, especially Alok Nath, who hoot up his Sanskari image and plays a hard-drinking old man, justifies. SKTKS has a good music, funny plot, and mass appeal, enough to make any film a hit at the BO. The film also highlights one-of-its-own kind of a relationship of a friend and would-be wife. SONU KI TITU KI SWEETY released on 23rd Feb. 2018. Please share your experience with us after watching the film.